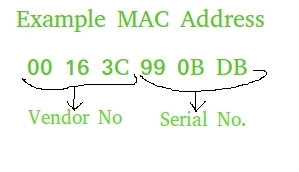 MAC address also known as physical address is the unique identifier that is assigned to the NIC (Network Interface Card) of the computer. NIC helps in connection of a computer with other computers in the network. MAC address is unique for all the NIC’s. Useful in places where IP address change frequently. Helps network admin. to get information regarding network traffic. Helps us to configure which computers can be connected to our computers. By this way we can filter potential spam/virus attacks. Helps in uniquely identifying computers from other computers around the world. This article aims at extracting MAC address of computer using Python. getnode() can be used to extract the MAC address of the computer. This function is defined in uuid module. The illustrated code given below shows how to generate a UUID for a given host, identified by its MAC address, using the uuid1() function. The visible drawback is that the output is not in the formatted form. # joins elements of getnode() after each 2 digits. This code appears to be complex.